Description: This tree is 30-80' tall, forming a single trunk about 1-3½' across and a rounded crown with large branches that are ascending to widely spreading. The trunk can be short and crooked, or it can be long and straight. Smaller branches and twigs are often crooked. Trunk bark of mature trees is gray to brownish gray, rough-textured, and shallowly furrowed with flat ridges. Branch bark and larger twigs are gray and more smooth, while smaller twigs and young shoots are pale brown and densely short-pubescent. Twig buds are about 3 mm. (1/8") long, brownish, and finely short-pubescent. Alternate deciduous leaves occur along the smaller twigs and shoots. These leaves are 3-6" long and 2-4" across; they are obovate in outline with 3-7 lobes (usually with 5 lobes) and their margins are smooth to somewhat undulate. A typical 5-lobed leaf has a cruciform shape resembling a Maltese cross; there is a pair of small basal lobes that are rounded or bluntly pointed, a pair of large middle lobes that are more square-shaped (although with rounded edges), and a small terminal lobe that is bluntly square-shaped or rounded. The sinuses between the lobes are mostly concave. However, the lobes and sinuses of individual leaves can exhibit considerable irregularity. The small leaf bases can be rounded, wedge-shaped (cuneate), slightly indented (cordate), or truncate. The upper leaf surface is dark green, hairless (or nearly so), and shiny, while the lower leaf surface is whitish green, light gray, or light brown from a dense coating of short stellate hairs. The leaf texture is stiff and leathery overall. The petioles are usually less than ½" in length, pale-colored, and short-pubescent. Like other Quercus spp. (oaks), Post Oak is monoecious, producing separate male (staminate) and female (pistillate) flowers on the same tree. Male flowers are produced in drooping yellowish catkins about 2-4" long. Each male flower has several stamens and a cup-shaped pubescent calyx with a jagged upper rim. Female flowers are produced in tiny clusters of 2-4 near the tips of twigs. Each female flower consists of an ovoid ovary that is embedded within a pubescent calyx with 3 rectangular lobes; there are 3 reddish styles. Both male and female flowers span about 1/8" (3 mm.) across. The blooming period occurs from mid- to late spring, lasting about 1-2 weeks. The flowers are cross-pollinated by the wind. Afterwards, fertile female flowers are replaced by acorns that become mature during the fall of the same year. These acorns are either solitary or they occur in pairs; they are either sessile or short-stalked (peduncles less than ¼" in length). At maturity, individual acorns are 12-18 mm. (½-¾") long and a little less across; their caps extend to about one-third of the length of the acorn. The caps have small appressed scales that are light gray or light tan and canescent, while the bodies of the acorns are light to medium brown. The meat of the acorns is white and slightly bitter. While young saplings produce thick taproots, older trees have root systems that are often widely spreading. Autumn coloration of the leaves is mostly brown, sometimes with yellowish or dark reddish tints. Cultivation: The preference is full sun and mesic to dry conditions that are well-drained. The soil can contain loam, clay, sand, or stony material. The size of this tree is strongly influenced by moisture levels and fertility of the soil. Toleration of drought and heat are excellent, while toleration of waterlogged conditions is poor. While it is normally a small- to medium-sized tree in the wild, in cultivation Post Oak can become large-sized. The growth rate is relatively slow; individual trees can live 200-400 years. Acorns are produced on individual trees in about 25 years. The acorns do not require a winter dormancy in order to germinate; they should be planted in the ground after falling during the autumn. Various fungi can produce spots, blotches, blisters, and blights on the foliage, reducing its attractiveness. Post Oak is hardy to at least Zone 5 if a northern ecotype is selected. Range & Habitat: Post Oak is native to west-central and southern Illinois, where it is occasional to locally common. Illinois lies along the northern range-limit of this tree. Habitats include upland woodlands, bluffs, upland savannas, wooded slopes, and rocky glades (including sandstone, limestone, and shale glades). Outside of Illinois, Post Oak is also found in dry sandy habitats. Sometimes this tree is cultivated in roadside and urban parks; it is also used for erosion control on exposed stony slopes. Common associates include other upland oaks (Quercus spp. ), hickories (Carya spp. ), and Eastern Red Cedar (Juniperus virginianus). Post Oak is found in average to high quality habitats where the soil is dry and infertile. It is not competitive with canopy trees that dominant moist fertile sites. Post Oak is able to resprout from its root system after most wildfires. Faunal Associations: Many insects feed on the leaves, wood, sap, acorns, and other parts of Post Oak and other oak trees (Quercus spp.). Insects that have been found on Post Oak include the flea beetle Paria opacicollis, the plant bugs Atractotomus miniatus and Neocapsus cuneatus, the aphids Neosymydobius albasiphus and Neosymydobius memorialis, and larvae of the moth Catocala similis (Similar Underwing). Post Oak is a preferred host of the following leafhoppers: Eratoneura igella, Eratoneura inepta, Eratoneura millsi, Eratoneura parva, Eratoneura tammina, Eratoneura tantilla, and Eratoneura ungulata (Dmitriev & Dietrich, 2010). The Wood-Boring Beetle Table lists beetle species with larvae that bore through the wood of oaks, the Lepidoptera Table lists moths, butterflies, and skippers with caterpillars that feed on oaks, and the Insect Table lists miscellaneous other insects that also feed on these trees. The medium-small acorns of Post Oak are eaten by many birds and mammals. Among birds, these species include the Greater Prairie Chicken, Bobwhite Quail, Wild Turkey, Eastern Crow, Blue Jay, Common Grackle, Red-Bellied Woodpecker, Red-Headed Woodpecker, Passenger Pigeon (now extinct), and others. Mammals that feed on the acorns include the Black Bear, Opossum, Raccoon, Gray Squirrel, Fox Squirrel, Southern Flying Squirrel, Eastern Chipmunk, White-Footed Mouse, and White-Tailed Deer. White-Tailed Deer also browse on the twigs and leaves occasionally. Photographic Location: A roadside park in south-central Illinois. Comments: Post Oak is an attractive tree that should be cultivated more often. It is relatively easy to identify because of the cruciform leaves that resemble a Maltese cross in shape. 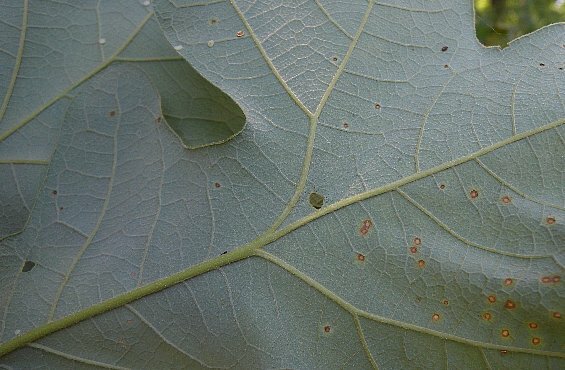 In addition, both the twigs and the leaf undersides are densely short-pubescent throughout, whereas many other species in the White Oak group have glabrous twigs and leaf undersides that are either glabrous or hairy only near the axils of major veins. In southern areas of its range (south of Illinois), Post Oak is a more variable tree and its leaves become more irregular in shape. 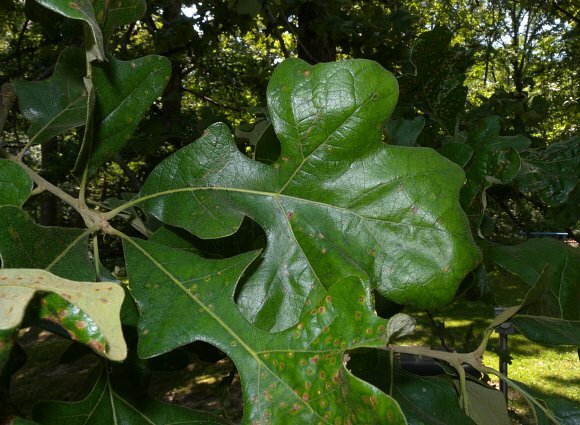 Perhaps the most similar oak species in Illinois is Blackjack Oak (Quercus marilandica), which is a small upland tree with leaves that are roughly kite-shaped. 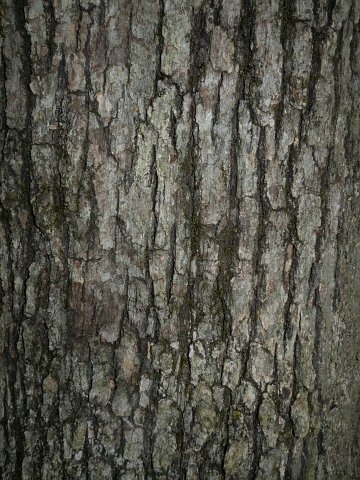 As a member of the Red Oak group, however, Blackjack Oak has bristles at the tips of its leaf lobes and its acorns take 2 years to mature. The wood of Post Oak is highly regarded for its strength, hardness, durability, and moisture resistance; it is fine-grained and brown-colored. As a result, the wood of this tree is used to make furniture, rail ties, mining timbers, fence posts, wooden stairways, wooden rails, floors, siding, panels, veneer, pulp, and construction lumber. It is also burned as a fuel.